Source: Sommerfeld Mennonite Church Centennial Celebrations, July 4, 1993, Morris, Manitoba, 1893-1993. 1993: 20. MacGregor, MB. Bishop John A. Friesen served in 1993 as a non-salaried congregational leader. In 1993 there were 285 members. The congregation has been affiliated with the Sommerfeld Mennonite Church of Manitoba. The language of worship is German and English. 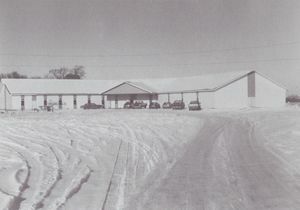 The congregation began services in 1960. The first building was occupied in 1960, with a subsequent building program in 1993. Sunday school started in 1960; an organ was installed in 1988. Sommerfeld Mennonite Church centennial celebrations, July 4, 1993, Morris, Manitoba, 1893-1993. 1993: 20. Steiner, Sam. "MacGregor Sommerfeld Mennonite Church (MacGregor, Manitoba, Canada)." Global Anabaptist Mennonite Encyclopedia Online. April 1997. Web. 23 Apr 2019. http://gameo.org/index.php?title=MacGregor_Sommerfeld_Mennonite_Church_(MacGregor,_Manitoba,_Canada)&oldid=132952. Steiner, Sam. (April 1997). MacGregor Sommerfeld Mennonite Church (MacGregor, Manitoba, Canada). Global Anabaptist Mennonite Encyclopedia Online. Retrieved 23 April 2019, from http://gameo.org/index.php?title=MacGregor_Sommerfeld_Mennonite_Church_(MacGregor,_Manitoba,_Canada)&oldid=132952. This page was last modified on 7 December 2015, at 01:13.